In the past, if you have been plagued with Slow performance of your data warehouse queries, there is some good news for you. With SQL Server 2012, we can now create ColumnStore Indexes, which would improve your query performance significantly. ColumnStore indexes are targeted for queries which use a Aggregations over columns or a set of columns. Assume we are running the following query against the table and that the table has about 1 billion records on approximately 40 million pages. In this case, we just need to do a sum of the values of column a. Given the row store approach, we would need to read the entire row (all the columns) to execute this query, which means we would need to read all the 40 million pages for this query and then perform the aggregation operation. When we create a column store index on the table, it changes the way how data is organized. Data for each column which is included in the ColumnStore index is arranged separately. For example if we created a ColumnStore index on the above table on the columns (a, b and c). The columns would be organized independent of each other on different set of pages. as shown below. Additionally, ColumnStore uses page compression by default. Most of the column values are similar if not same, and hence can greatly benefit from compression. Now, with this arrangement, if we run the above mentioned query, we would only need to read pages for Column a, which in the above case would be only about ~300K(assuming 40% compression) of pages to read and sum the values of a, then another ~300K(assuming 40% compression) pages for the average of b and finally ~500(assuming 50% compression) pages to calculate the Max of c.
As mentioned, this type of organization helps queries where we are returning only some of the columns from a table. For queries where we need to return all the columns in a row, Row-Store approach works better. Typically, OLTP workloads benefit from row storage organization of data, while warehouse queries would benefit from ColumnStore index. The MSDN Article describes the restrictions or limitations to creating ColumnStore indexes. One thing to keep in mind, that when u create a ColumnStore index on a Table, you cannot Update the table. In Order to update the table, the quickest way would be to drop the column store index and then perform your insert, update, deletes. 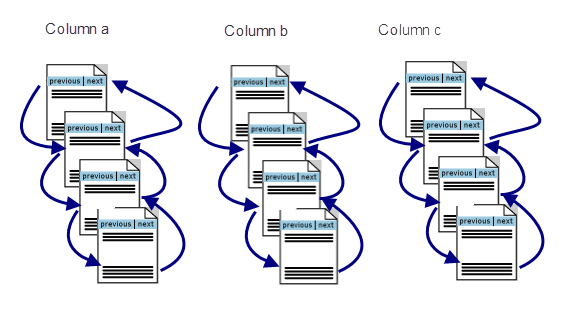 Once you are done with the DML’s, the ColumnStore Index can be recreated. I create two tables with the same schema but one with only a ColumnStore Index and another with a Clustered Index and a non clustered index. Both the table have about 7.7 million records. This tables have been created on the AdventureWorks2012 sample database, which can be downloaded from here. I executed the below mentioned query on the two table to compare the performance. In the Query below, I am just substituting the Name of the tables([TableWithColumnStoreIndex], or [TableWithoutColumnStoreIndex]) While executing. When executed against the Table without ColumnStore index, the query table takes about 1248 millisecond. When executed against the Table with ColumnStore Index, the query executes in about 218 milliseconds. A 5x performance improvement.